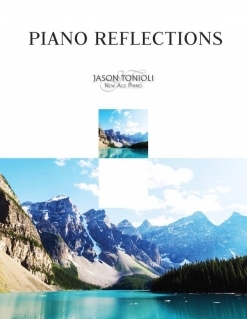 Piano Reflections is a collection of eleven piano solos by pianist/composer/arranger Jason Tonioli. Tonioli has released nine recorded albums and has a fairly large collection of sheet music and songbooks on his website, but this is my first exposure to his music. Overall, it is warm and melodic with a positive message to convey, and I plan to get acquainted with more of Tonioli’s music very soon! The pieces in this book have not been recorded yet, but Tonioli is planning to record them later this year (2019). Several of the pieces were inspired by hikes in the mountains and by being out in nature while others come from various life experiences including helping other people by teaching or being a dad. The printed version of the book is spiral-bound and printed on a medium-weight bright white paper. The notation is clear, well-spaced and easy to read. The book includes an introductory page where Tonioli explains that the pieces were composed over a period of about twenty years, as well as how he revisited and worked on the various “sketches” during that time frame. Most of the pieces also have “side notes” at the top of the first page that give suggestions about how to play the pieces and /or what inspired them. I did find some notation errors as I was playing the songbook, but they really shouldn’t affect the playability of the music at all. The title page of the book gives the playing level as “Intermediate/ Advanced Piano” and I agree with that except I’d go to “Early Advanced” since none of the pieces seemed difficult to me. There are no pedal markings or metronome settings, so that leaves playing speeds pretty much up to the individual pianist. However, most music suggests its own correct speed as it’s being played, so that shouldn’t be an issue. Piano Reflections is a very enjoyable songbook to play and most pianists at an intermediate playing level and above should find the music fairly easy to master. The printed books and downloads (PDF) are available from www.Tonioli.com.